The federal government has placed Nigeria on red alert following report of fresh outbreak of Ebola in the Democratic Republic of Congo, according to a Leadership report. 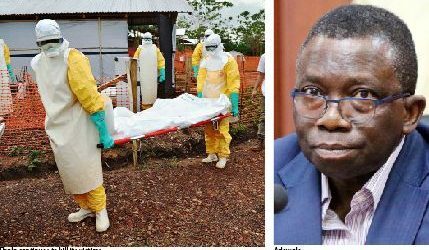 This is just as the minister of Health, Prof Isaac Adewole called for heightened vigilance and intensified awareness efforts on the symptoms of hemorrhagic fevers. A statement signed by the director, Media & Public Relations, Boade Akinola on the minister’s behalf, noted that health care providers and the general public must immediately report any sign of illness to the public health officials immediately. The statement read in part, “ The federal government in response to the announcement by the World Health Organisation (WHO) on confirmed cases of Ebola in the Democratic Republic of Congo(DRC), has directed port health officials to step up inspection activities and to report any sick person or suspects to ensure that the state epidemiologist in the states where they are present is immediately alerted and relevant tests conducted. “The symptoms to look out for include; fever, fatigue, weakness dizziness and muscle aches. Patients with more severe cases show bleeding under the skin, internal organs or even from bodily orifices like mouth, ears, and the ears. The minister called on states to begin social mobilisation and media awareness efforts via TV, radio, print and social media and also charged state health ministries to strengthen their supervision services and escalate any incident appropriately. However, the head of Communications at the Nigerian Centre for Disease Control (NCDC), Dr Lawal Bakare said the country won’t be placing a travel ban on Democratic Republic of Congo. Bakare noted that there was no cause for alarm as Congo DR has had several outbreaks and has been able to overcome it. Lawal said, “The NCDC is aware and in touch with appropriate international agencies, we are also getting prepared. “People don’t need to panic, Congo has had outbreak in the past, this is about their eighth outbreak since 1976, even during the 2014 Ebola outbreak, they had one and came out of it ahead of some other African countries. “In terms of further development, we are going to have our official meeting on Monday from which we will be able to give proper directive. But we are at alert; we are following up on the development. Similarly, the minister has encouraged members of the public to observe a high level of personal hygiene which include, regular hand washing and to also report all cases of fever to the nearest health facility. This is even as the management of the Federal Airports Authority of Nigeria (FAAN) has assured Nigerians of adequate surveillance at the nation’s airports. FAAN’s acting general manager, Corporate Affairs, Henrietta Yakubu, Corporate Affairs, in an interview with News Agency of Nigeria (NAN) on Saturday, said that there was no direct flight from Congo to Nigeria. “There are sanitizers at our arrivals with the scanning apparatus called Thermal scanners being installed by the Port Health Services. Nigeria experienced the Ebola outbreak in July, 2014 when a Liberian American, Patrick Sawyer, who had the disease flew from Liberia to the Murtala Muhammed International Airport, Lagos and died five days later.